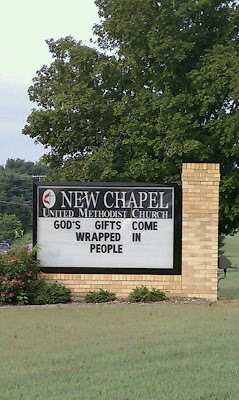 It was a sweet reminder for me as I drove up the country highway: "God"s gifts come wrapped in people". Immediately, faces came to mind, and I retraced their footprints on my heart. I have been given some wonderful gifts in the men and women who have crossed my path. And then I paused for a moment. I realized there was more to this than I had initially appreciated. I had been thinking only of the people I had grown to love. I had totally forgotten the OTHER gifts, wrapped in the OTHER people. I had forgotten of the impatient woman pacing in the grocery line, or the man speeding past me on the highway. Then, there was the woman so stuck in "victim" that it made my skin crawl. These other people are also gifts - they show me who I am, who I have been, and who I could be again, if I forget who I am in Him.